Sorry no longer available in December, 2015, we have the AMAZE1 now. You need a 1/4" stereo patch cord to connect this to the ARDX20, there is an optional one at the top right of this page or you can use your own. It does not need to be high audio quality. There are other sizes available on our website or on the right side of this page. Sorry no longer available, see AMAZE1 instead. Discontinued, ee now have the AMAZE1 instead. Not available since 2015 but we have a new version available in 2017, the AMAZE1. The Analog Man AMAZE0 Analog Delay Tap Tempo and Modulation Controller pedal controls our ARDX20 Analog Delay. Has tap tempo with several types (dotted eight notes, etc), modulations with speed and type, and 8 banks of preset delay times with programmable modulation on each preset. There are two modes : TAP TEMPO MODE and PROGRAM mode. To change the tap note type, hold down the right button and it will scroll through Quarter (normal), Eighth (double speed), and Dotted eighth note (Floyd/U2 etc) settings. Tap the right button to enter the delay time. The delay time is shown on the top right, the tapped time is shown on the bottom left (same if Quarter selected). Pressing the left button turns modulation on (see ^v in top left) or off (see --- on top left). When modulation is on, you can adjust it with the two knobs. Left knob is modulation speed, 1 through 10, 10 is fastest. You will see the top left figure ^v move in the speed that is set. The right knob is used for MODULATION TYPE. Modulation type 1-5 are normal up/down smooth sine wave modulation, 1 is mildest and 5 is the deepest setting. Modulation type 6-10 are the TAPE DELAY SIMULATION, a random WARBLE type modulation, 10 is the deepest. This simulates the variances in delay time on a tape delay due to capstan and roller imperfections, tape snags, and other random events. To go to PROGRAM MODE, hold down the left button. You will see [P:X] where X is the selected program number. The delay time and modulation type and speed for that program will be displayed. Press the left button to toggle modulation on (^v in top left) and off (--). and the modulation type AND speed manually with the left knob. Each program can be edited for delay time and modulation speed and type. To go to Tap Tempo mode from Program mode, hold the left button. Two expression pedal jacks. Optionally plugging an expression pedal into either of the two center jacks will control the knob closest to that jack remotely. Boss FS-6, which will work just like the two switches on the AMAZE0. This allows remote control of the AMAZEO or MIDI control of tap tempo, etc. You can also use this jack as a TAP TEMPO OUTPUT to sync to other pedals. The tip will be the right (tap tempo) switch and the ring is the left switch which you don't need to use. Runs off normal Boss 9V power supply. Do not use a power cable without ground connection.Uses about 30mA of power, best to give it an isolated power cable from Voodoo Labs, T Rex, etc power supply. I don't like to share power with digital devices but you can if you need to. You need a 1/4" stereo patch cord to connect this to the ARDX20, there is an optional one at the top right of this page or you can use your own. It does not need to be high audio quality. If you want the delay to sync to MIDI, it can be done by plugging one of these Molten Voltage CTL-SYNC boxes into the AMAZE0. Let me know if you want to order one for $139 together with your AMAZE0. This little box turns the ARDX20 from a great-sounding 2-in-1 delay pedal into a full-on modern delay unit. Essentially gives you 10 presets, tap tempo, and modulation controls. Can accept external tap; I kinda wish it had a direct MIDI in rather than requiring a MIDI converter device, but I also realize relatively few guitarists have rigs that incorporate MIDI anyway. The AMAZE0 is pretty simple to program & use. The construction feels solid & durable, just like every other AM pedal I've owned. As on the ARDX20 itself, it would be nice if the four jacks were labelled on the unit; again, I ended up making little labels for all of them to keep them straight on the fly. If you want to access everything the ARDX20 can do, you'll need the AMAZE0. If you're a big delay user making the ARDX20 your primary delay, the AMAZE0 is a must. Reviewer: Randy LeRoy from Airshow Mastering, Takoma Park, MD. Hey Mike… just wanted to drop you a note to say thanks for getting my AmazeO out so fast to me and how much I really love this controller for my ARDX20. The tap tempo feature is sweet but….. the modulation feature it add is "AMAZING" !! There are times when a chorus or phase shifter is just a little too much modulation. I find that I can get just the touch I'm looking for with the AmazeO . I love the tape "flutter" sound. 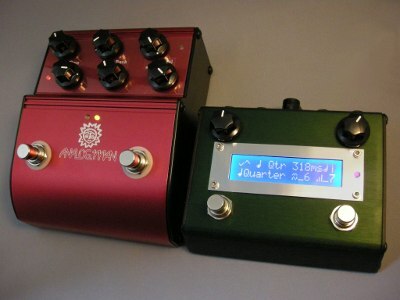 When I bring out my pedalboard for the guitar players who come into our studio they simply love the AnalogMan gear. If you're ever interested in putting on a pedal demo in the D.C. area, I'd love to host the gathering at our studio. Made the ardx20 incredibly usable. Easy directions to follow. Beautiful modulation! My only knock is one cannot control the feedback and delay levels with it, to have pre-sets with long decaying, ambient delays and pre-sets with a quick dying delay. It may sound a bit nit-picking, but the pursuit of perfection must not be complacent with success. Over all I am extremely pleased with my purchase. I´ve got one of the earliest batches of the amaze0. And it works just the way it is supposed to. since last spring, its been with me on all my gigs. The one thing is the tap function. Its super, never needed any calibration. The other thing is the modulation. Its so sweet! just the way a delay-modulation should be. After Mike told about the mod you can do to your ARDX20 on TGP, my amaze0 works on both channels. And that is great. That brought the combo up a notch. long crazy delays on one channel, and subtle "normal" on the other channel. both in time and the possibility of modulation.